This year made history in women’s Brazilian Jiu Jitsu. The start of the year saw a petition circling the social media pages that was started by Karen Peters and her coach Carlos from Gilroy BJJ in California, to get the International Brazilian Jiu Jitsu Federationto add Master 2-7 age categories to the Pan American Championships. 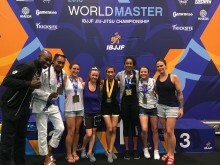 Many people signed and the IBJJF finally gave the women of jiu jitsu what they wanted, a fair shot at competing with other women who were close in age. It was the fourth year that the World Masters Championshipshave been held in Las Vegas, and each year it has grown in size. The venue is huge, with well over 400 competitors taking part. How do BJJ age categories work? The IBJJF classifies athletes into divisions based on age: Juniors & Juveniles up to age 17; adults for ages 18-29 and Masters for athletes aged 30+. Masters are further broken down into 5-year age brackets. Master 1 is for ages 30-35, Master 2 for ages 36-40 and so on. So Master 7 is for athletes aged 61 or older. This year over 200 women registered for Master 2+, including the first ever Master 7 competitors. 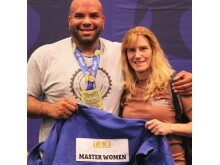 The camaraderie of the event sparked many women from the UK to sign up and compete in the World Masters in Las Vegas. For some, it was a chance to compete for the first time in their age division, others, and it was the first time they had ever competed in a BJJ tournament. This tournament brought women out of competition retirement because they knew the importance of using what you’re given, or you will lose it. There was a barrage of female competitors from the UK in this year’s championship. It was the first time that Yasmin Wilson of Roger Gracie Academy had been to the tournament, or even to Las Vegas. 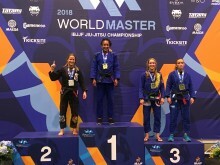 She competed in the Black belt Master 2 featherweight division, and after two strong performances, she ended the final match with a triangle from the back and secured the arm bar for a win and to be crowned the new World Master Champion. Leoni Munslow of New School BJJ in London upped her game from last year and took the bronze in the Black belt Master 1 lightweight division. 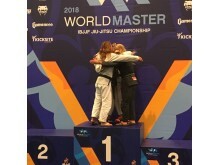 Annie Kohne (although she is of South African decent, she resides in the UK) took silver in the Brown belt Master 4 lightweight division, beating her nemesis in the first round, and for anyone who has one, this in itself is a major win on such a huge stage. I myself took a bronze in the Brown belt Master 3 featherweight division, and so did Oyinda Oduntan of CFS in Manchester in the master 1 Blue belt middle division. Eira Culverwell of CRA in Swansea dropped a few kilos to get to the Blue Belt Rooster division and very deservingly took home a Bronze medal after 3 tough fights. 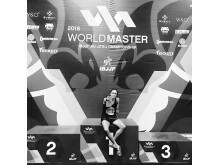 What's it like competing at the IBJJF World Masters? Looking around the Las Vegas convention Center, it was full of people who refused to limit themselves when it came to competing. We all know that when we get to a certain age, we don’t feel that age, especially when we train jiu jitsu. Possibly not the morning after a heavy sparring session or competition training, granted. But it makes our body move well, keeps our mind active, focussed and our souls feel alive. I’ve been lucky enough to have experienced and competed in 5 world masters events. There was something different about 2018. 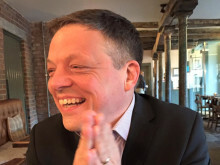 You would catch the eye of another woman with greying hair and give the look that you’re in some sort of secret club, you’re here to create a historical year in the Worlds Masters Championship, to make a bond and sense of togetherness. 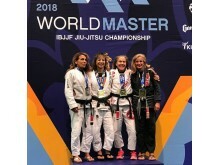 What’s next for women at the World Masters? Karen Peters and her coach Carlos have created T.A.P. Together All Powerful from starting the petition for the Pans, and they haven’t stopped there. There is still an inequality with the IBJJF ranking system and they are looking in to addressing this. 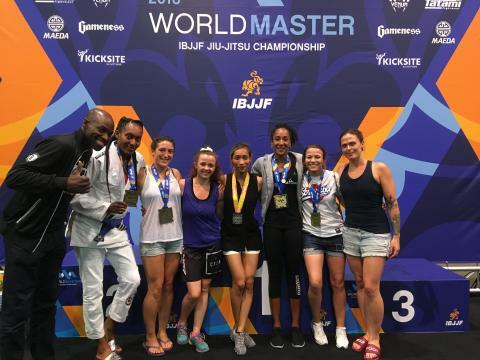 The dust certainly hasn’t settled, and the creation of the Masters BJJ Women group on Facebook has become a platform to strengthen the divisions in IBJJF as well as local tournaments. For now, the master women from around the globe who went there and competed: win or learn, be proud that you have become part of history and this incredible event. If all this can happen in 2018, can you imagine what’s to come from now on from one of the fastest growing sports in the world?